Eleven men have applied to be Flagler Beach’s next fire chief, a position the city reclassified as “Fire Captain.” It is widely believed that City Manager Bruce Campbell will award the post to Bobby Pace, the suspended firefighter fighting a first-degree misdemeanor charge of obstruction of justice, and the only non-volunteer fireman to apply for the position from within the fire department. Campbell has been delaying the appointment–in part to focus on the appointment of a new police captain, which was concluded last week when he named Matt Doughney to the post, but also to enable Pace to be a contender for the position free of the criminal case against him: Campbell could not appoint Pace if the case was still undecided. Appointing Pace if he were to be found guilty would be a complication–or an embarrassment–the city would rather do without. Pace has been on paid administrative leave since the State Attorney filed the misdemeanor charge in July, after a Flagler Beach police investigation concluded that Pace had falsified the records of a probationer’s community service hours at the fire department and destroyed video evidence. When the police department filed the charges against Pace, it included a felony charge for destruction of evidence, but the State Attorney opted not to pursue that charge for lack of evidence, as its prosecutor would have been placed in a position to prove a negative. In a meeting at the State Attorney’s office, Campbell himself pleaded Pace’s case (Libby Kania, the city’s human resources director, and a third staffer were also interviewed at the State Attorney’s office). Campbell disciplined Pace regarding the falsified paperwork, but also termed the issue only a matter of “rounding” numbers, rather than anything more severe. He wanted the matter left at that. Pace’s case was part of a series of scandals that shook the Flagler Beach Fire Department going back to last year, when then-Fire Chief Martin Roberts was embroiled in a confrontation with Campbell after Roberts took an out-of-state trip to scout fire engines–on his and manufacturers’ dimes, not on the city’s–with other firefighters, without Campbell’s explicit approval. The matter exposed a deep rift within the fire department, and seemingly irreconcilable differences between Campbell and Roberts. Roberts faced being fired for insubordination, but he fought the charge and won his job back–only briefly: In January, Pace, in a two-page letter to Campbell, accused Roberts and others in the department of drinking at a Dec. 14 Christmas party, then going to a fire call (or, in the case of two other firemen, storing home-made alcohol at the fire department). Other firefighters filed their own letters corroborating the accusations. For $10,000, Campbell hired a Winter Park law firm to conduct an investigation that soon gave him cover to fire Roberts, Assistant fire Chief Shane Wood, firefighter Jacob Bissonette and Fire Police Captain Steve Wood, whom the investigation had concluded were part of one “clique” at loggerheads with another in the department. Pace headed the other. It was Bissonnette who had been the main source of the accusations against Pace, regarding the probationer and the falsified documents. In August, he and Shane Wood filed suit against the city, charging that their firing was retaliatory for what had been a whistle-blowing act. Wood, too, had cooperated in the police investigation of Pace. And it was Pace who raised the matter of Bissonnette and Wood storing alcohol on city premises. Wood and Bissonnette don’t deny that they’d stored the alcohol there briefly, but consider the infraction relatively minor and non-criminal. They’ve considered themselves treated by a harsher standard by Campbell than he’s applied to Pace, who remained on the job even after the police department filed charges against him. In late September, Michael Roper, an Orlando attorney the city hired to fight the Bissonnette-Wood lawsuit, rejected their claims and filed a motion to dismiss the case. The city argues that Wood and Bissonnette did not exhaust all their administrative remedies before filing the lawsuit, and that they took a “shotgun” approach in a complaint that includes “immaterial, impertinent, or scandalous matter” in violation of civil procedure rules. (The “immaterial,” “impertinent” or “scandalous” matter, however, related to the charge against Pace, which was a matter of fact). City policy grants employees the right to file whistle-blower actions, in writing, but by way of the city manager, and within 60 days of the matter contested. The city’s response also argues that Wood and Bissonnette should be filing their actions separately (if at all). A hearing is scheduled for November 20 before Circuit Court Dennis Craig. Dennis Bayer, who represents Bissonnette and Wood, will be filing a response to the motion ahead of that hearing. 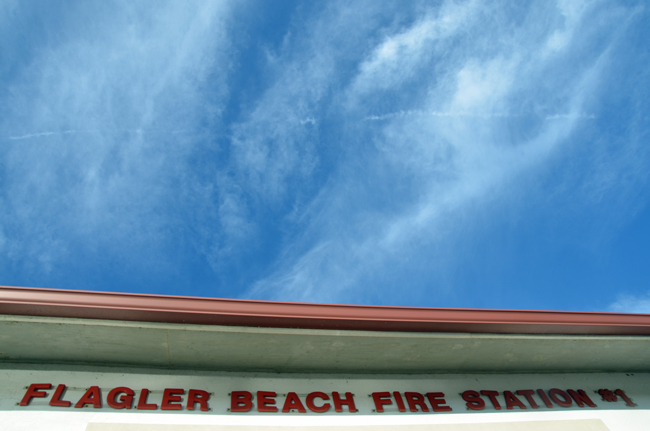 Meanwhile, the Flagler Beach Fire Department has been operating under Campbell’s administrative leadership, with a paid staff covering every shift (several formerly volunteer firefighters were added to the paid ranks). I think for the sake and reputation of the “formerly volunteer firefighters” it should be added to the record that they have undergone a formal screening and hiring process before being chosen for the job. Also, it may be fair to add that the department has additionally been under the leadership of the three lieutenants managing each shift. Well Smith John, If the electees were given a formal screening and hiring process HOW did Pace get though the screening??? Pace has a DUI charge and 2 charges of having alcohol in a vehicle in his past look at his driving record and oh plus he is currently under a criminal charge in the courts now. Evidently you did not get the Steve Cox message that NO ONE is to respond as a member of the FD. As for the LTs they are no more than Campbells little do boys. PCResident you are right in that the only ones that are even real named people are Pace and Seymour who both are Campbells do boys with Pace going to be his cjoice because Campbells says so. I would like to know who is the 4 interviewers that Campbells says is doing the selection of the Captain position for the FD if there is any one doing it. This is all for show so Campbell can say he was fair for everyone involved in the PD and FD position. We all know Campbells credibility is ZERO in anything he says its all a show. Better check with Manfre first, before you make your decision…. Since he seems to be an expert on what’s best for all of Flagler ……..
Not all of the people listed above are being interviewed. They may have met all the critieria and may be highly qualified for the job, but they weren’t even brought in for interview. So we won’t know who was most qualified for job. I wonder how they decided on the people to actually interview. Did Manfre have a say-so in this too? Makes me sick…so much corruption! Is the city supposed to offer the job in house before public? first of all, interviews haven’t started. this will probably happen sometime Next week. secondly, the 11 people listed actually applied for the job and will be interviewed unless any of those individuals decide otherwise. thirdly, manfre has Nothing to do with it. kick a guy for being honest about the process and twist it up to be negative. whatever. here’s a thought. keep things “status quo” and in time we can be gobbled up by palm coast. then we’ll see what happens to our fire and police. I don’t see my name on the list. I put in an application March of 2013. I called Mr. Campbell as a followup and was told I would be considered. Its a shame Manfre, has his hands in the Bunnell Police Department, Flagler Beach Police Department, Flagler County Emergency Management and now Flagler Beach Fire / Rescue. This man has nothing better to do, but worry about everyone elses problems except his own. Wait I hear OBAMA calling him to run the country for him next lol. If Pace is so innocent in this why did he have to make a DEAL to not have to go to court and prove he is innocent. How can he be interviewed while being in this and how can he be selected while being in this criminal charge. Thats right because Campbells says so. Congratulations to Bobby Pace as the new Fire Chief/Captain of the Flagler Beach Fire Department. We know that Bruce Campbell has already made his selection as Pace is his “Do Boy”.